HCM CITY – Public transport management in HCM City has greatly improved compared to five or seven years ago, thanks to modern technologies, experts say. Trần Chí Trung, director of the Management and Operation Centre for Public Transport, said that cameras and global positioning system (GPS) devices had significantly improved bus operations management. Trung said that supervision five or seven years ago was done only at the beginning and ending points of bus routes. Random, unannounced checks were often done by the centre’s staff at that time as well. But when the first GPS devices were set up in 2012, supervision improved. The centre staff are now are on duty from 4:30am to 9:30pm every day to supervise the operation of all bus routes. Managers as well as transportation companies have benefited from the modern equipment. 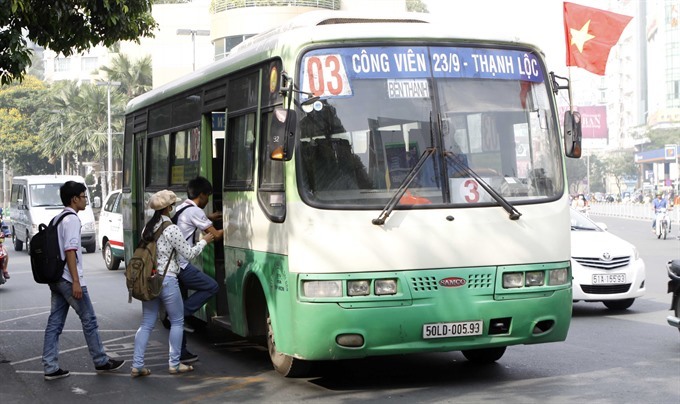 Nguyễn Văn Triệu, director of the May 19 Bus Transport Co-operative, said that before GPS devices and cameras were installed, manual supervision was used, but it was not effective as human resources were limited. In addition, the co-operative had 500 buses running on 18 routes. Other bus companies have said that cameras and GPS devices are useful as they monitor bus operations and drivers’ work ethic. With the system, they can promote or punish drivers. The first GPS devices on city buses were used in 2012, and two years later, cameras were installed. Now, all buses in the city have GPS devices, while nearly 2,000 buses have cameras. Each bus has four cameras. One tracks the route, one follows activities of the driver, and two of them supervise security. GPS devices monitor the bus’s speed, routes, opening and closing of doors, air conditioning, and the time the buses run. All information taken from cameras and devices are sent to the online operating office. Thanks to the equipment, managers can correct driver’s work attitude and behavior such as eating and using a phone while driving. In March, the Management and Operation Centre for Public Transport received a call from a man looking for a lost 6th grade girl who was his relative. The girl had caught a bus on Hà Huy Giáp Street in District 12. From the equipment data, the centre found the route and buses that the girl had used and were able to locate her. In another case, a passenger reported that the driver of bus on the An Sương – Bến Thành route braked suddenly, causing elderly people to fall down. The driver did not say he was sorry and did not have a good attitude when other passengers complained. Examining the cameras, managers discovered the case and temporarily suspended the driver, asking him to re-study the codes of ethics.